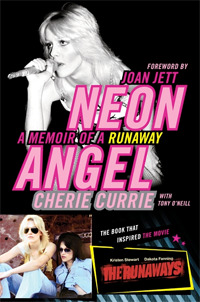 Right now, you can get the Kindle version of Neon Angel: A Memoir of a Runaway, The Runaways singer Cherie Currie‘s autobiography, for only $2.99. I’ve read this book MANY times and have several copies of it (and multiple editions as well). If you’re a fan of The Runaways, this is a must-read. Also, Neon Angel is what The Runaways movie starting Kristen Stewart (as Joan Jett) and Dakota Fanning (as Currie) was based on. In the book, Currie talks about her upbringing and then goes into detail about her time with The Runaways, which was an all-girl teenage rock band in the 1970s and if you saw the movie, you see just how hard these young girls had it and what they did for rock and roll. Currie’s original version of the autobiography had been out of print since the 1990s, but thanks to It Books, the book is not only back in print, but has also been improved upon. More than worth 3 bucks, so grab this right away, the sale ends at the end of the day, Friday, December 23, 2011. If you’d like a physical copy of the book, the Hardcover is $16.49, while the paperback is $10.87. NOTE – you don’t actually need a Kindle device to read these ebooks. Books can be read on a Kindle or one of Amazon’s free reading apps for iPhone, iPad, Android, Windows PC, Mac, Blackberry, and Windows Phone 7. Also, you can gift Kindle books and set your gift to be delivered whenever you want to anyone with an email address. Cherie Currie, with her signature Bowie haircut and fishnet stockings, was the groundbreaking lead singer of ’70s teenage all-girl rock band the Runaways. At the tender age of fifteen, she joined a group of talented girls—Joan Jett and Lita Ford on guitar, Jackie Fox on bass, and Sandy West on drums—who could play rock like no one else. Arriving on the Los Angeles music scene in 1975, they catapulted from playing small clubs to selling out major stadiums, headlining shows with opening acts like the Ramones, Van Halen, Cheap Trick, and Blondie. Currie lit up the stage with the provocative teen-rebellion songs “Cherry Bomb,” “Queens of Noise,” and “Born to Be Bad,” riding a wave of hit songs and platinum albums, all while touring around the world. On the face of it, Currie’s is a riveting story of girl empowerment and fame. But it is also an intensely personal account of her struggles with drugs, sexual abuse, and violence. She and her bandmates, runaways all, were thrown into a decadent, high-pressure music scene where on the road, unsupervised for months at a time, they had to grow up fast and experience things that no teenage girls should. Neon Angel exposes the side of the music industry fans never get to see, and chronicles the group’s rise to fame and their ultimate demise. Shocking and inspiring, funny and touching, Neon Angel stunningly re-creates a bygone era of rock and roll, all the while providing an inside look at growing up hard under the relentless glare of the public eye, and chronicling one tough woman’s fight to reclaim her life.